photo by Alan Light. 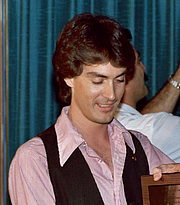 1982 Inkpot awards. Best known for creating the "Rocketeer" comic book, as well as illustrations of pin-up model Bettie Page. Dave Stevens is currently considered a "single author." If one or more works are by a distinct, homonymous authors, go ahead and split the author. Dave Stevens is composed of 2 names. You can examine and separate out names.